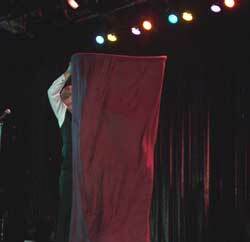 Here are some reviews of their performance at the Society of American Magicians Convention in July 2007. "Mica and Judy- once again you had them rolling in the aisles. ...Such pro's - soooo funny." - Chuck Lehr, National Secretary, Society of American Magicians. Click on the sign above for Six Flags photos. Here are some photos from a recent performance of "The Shower Curtain of Death" aboard the Carnival cruise ship. "The Elation" for an estimated 1500 people. "ENERGETIC, OUTGOING, AND MEMORABLE. THE ULTIMATE PROFESSIONALS IN ANY SITUATION. OUR AUDIENCES LOVED THEM!" 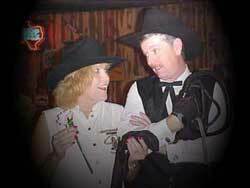 With Magic, Comedy and a Thrilling Bullwhip Act, Mica and Judy will add another dimension that makes your special occasion something to be remembered and talked about. Involving the audience is their specialty. 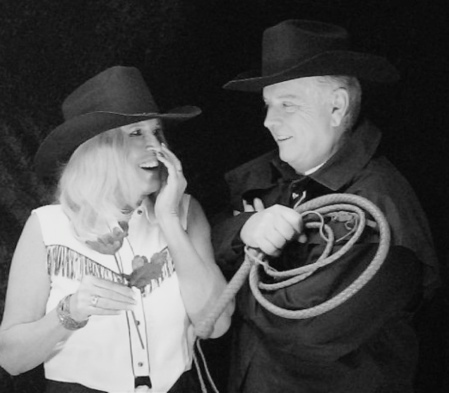 RIOT ACTS ENTERTAINMENT will help you bring LAUGHTER, FUN, and EXCITEMENT to your special event. "I AM SURE THE CROWDS VISIT OUR FESTIVALS EACH YEAR TO SEE YOUR ENTERTAINING SHOWS!" on this "thrilling" bullwhip act. Selecting or employing the best individual elements from a variety of sources, systems, or styles. Made up of or combining the best elements from a variety of sources. Not Heavy. Employing less than the standard. A performance of magic and amazement. An event creating laughter and gasps. A lighthearted, fun and entertaining period of time. If you are looking for a different type of entertainment consider 'Eclectic Lite' This show combines various skills and talents, as well as a variety of routines. This act is often performed at theme parks or for special occasions where people want to see things they have never seen before. Some of the most amazing tricks are real! You won't believe you eyes. These types of routines are a hit with college students and holiday parties. We can also incorporate juggling and many other forms of entertainment. The Shower Curtain of Death! A Different kind of Escape Trick! With the help of an audience member Judy is completely bound with ropes. 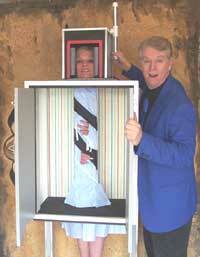 The audience member is then instructed to hold a curtain up in front of himself and Judy. He raises this curtain and moments later he lowers it. Judy remains tied with all the ropes but the jacket worn by the audience member is now ON HER and under the ropes he tied! Together Mica and he untie the ropes to free her and his coat. The audience member is the most amazed. All he knows is the coat came off the instant the curtain was raised. This can be performed surrounded and for those times when men generally do not wear one, a sport coat is provided. A huge hit with audiences. Larry Garlutzo, Cruise Director for Carnival Elation. Mica performs some of the most amazing close-up effects that you must see to believe. This type of magic is very popular at parties and other small events. The sharp loud crack of a bullwhip slicing through the air always gets people's attention. Cringe as Mica slices objects out of the hands and mouth of his fearless assistant, Judy. Did we mention that he does it Blindfolded? Click on photo for more info and demo. Watch as Mica brings medieval medicine to the 21st century. There is no cure for sinus pressure like a 6 inch spike in the ol' sinus cavity. This act is presented with an emphasis on comedy. There are several "products" that are presented as though we want you to sign up for multi-level marketing. 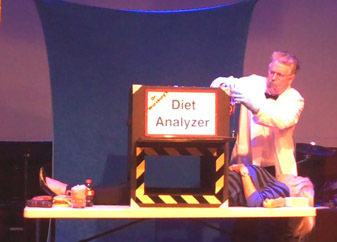 They include: "The Sino-Spike", "The Lingunator" (Weight Loss System) and "Stick-It Pain Management Program." This show is in demand nationally. Count on years of experience in entertaining audiences. Locally you may have seen them at the Taste of Dallas, the Funny Bone Comedy Club, on Good Morning Texas, Good Day Dallas, and on other various television shows. Whether a private party or a spectacular corporate event, you may book with confidence knowing they have much needed experience to please your guests and make you look good! STARSHINE Magazine, Dallas Historical Society. We would be honored to accept your credit card at your location. 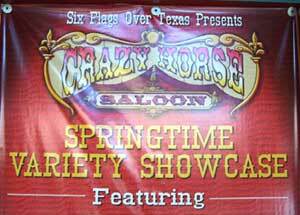 Click here for theme entertainment options.